This is a yummy snack all on its own or served with your favorite fish for “fish and chips” with a twist! This dish make a healthy appetizer if you use them to dip into fresh soup. 1. Place yam wedges skin side down on a large microwave-safe plate. Cover with vented plastic wrap. Microwave on high 3 ½-4 mins, or until almost tender. Let cool. 2. Heat an outdoor gas grill, or prepare coals for a charcoal grill for direct grilling over medium-high heat. Add yam wedges. 3. Grill yams, keeping the grill lid closed as much as possible, until lightly charred, 6 to 8 mins, turning as they brown. Serve with a delicious sauce or condiment of choice! This sounds so good! There was a restaurant in my college town that served sweet potato chips with everything and they were soooo good. They also had unique dips, like a cilantro cream dip or something like that, and the combination was amazing! I look forward to trying these. They were the perfect healthy accompaniment to hamgurgers instead of French fries. I made this with lunch today and it was soooo delicious! I made some guacamole with it, which went really well. My recipe for this is very simple–mashed avocado, salsa, lemon juice, and a dash of apple cider vinegar. 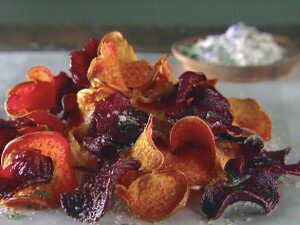 I added a lot of sea salt to the sweet potato chips, too. Terrific! These look fantastic. I get soooo tired of other chips and snacks, plus these seem really guilt-free. After all, they’re made straight from vegetables LOL. I like to eat real food, I get so tired of processed foods. Thanks for the recipe! I’m sure these will come out best on a grill. My husband is getting a new grill for the summer and we’re sooo excited about it. There’s something about grill-cooked food that brings out so much flavor especially with vegetables. During the winter, there are some veggies I bake in the oven or steam that I just don’t care too much for, but over the grill in summer I absolutely love them and can’t get enough! We grew up with these and always ate them in the summertime especially at our family barbecues. Oh how this brings back memories! These chips are waaaaay better than potato chips and french fries and they’re so nutritious too! Hi Tina I made these today and they were really good. They also felt really healthy in my body. It was like eating a serving or two of vegetables! My thanks to your readers who have shared some excellent recommendations for these sweet potato chips. I made them last night and added paprika and more sea salt. Then I paired it with some delicious homemade salsas and a homemade guacamole that my KIDS made (I’m so proud of them, they’re really doing a great job learning how to cook gluten free for themselves). Two thumbs up!